- FOCUS ON DETAILS: The attached foot pads can protect your floor very well, they are adjustable, can be used on the uneven ground. - UPGRADED CONSTRUCTION: Added fixed screws, more sturdy, less shaking, more secure. 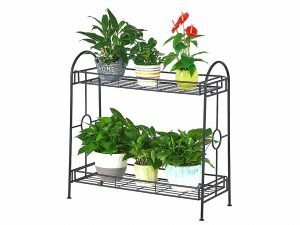 - STURDY AND DURABLE: The sturdy metal construction with black powder coated finish will last for several years. - EASY TO ASSEMBLE: Very easy to assemble, just takes few minutes.